Why not use a large telephoto lens you might ask? …Well we did, but the birds are small, and the depth of field very limited to get great shots of two birds. I wanted to try something fresh in order to get unique photos, and think this was achieved. 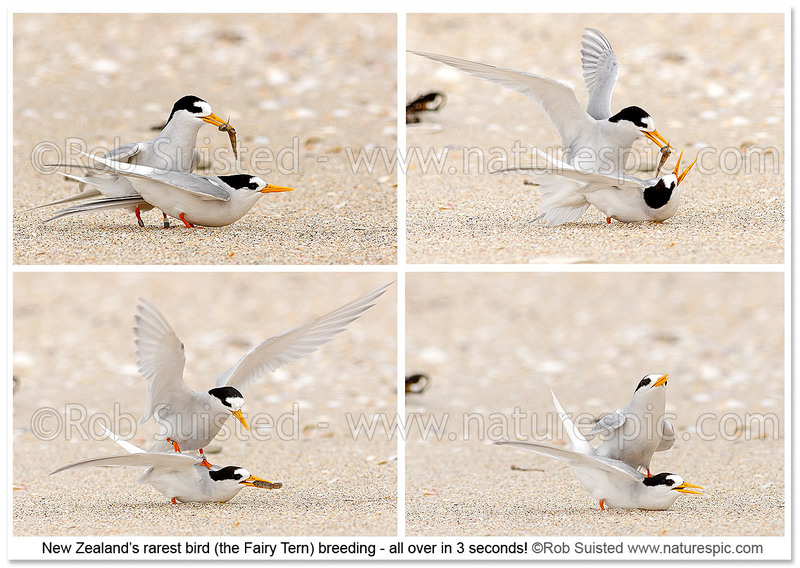 I was lucky to score a photo sequence for fairy terns mating! Now that’s a story – when you have rare birds then breeding is of course rarer, and potentially the reason why there are rare. The poor boy spent all morning eniticng and wooing his girl with various fish treats. Finally she relented, lay quietly at his side for him to climb on. He neglected to hand the fish over, but she was demanding. In the time it took for her to swallow the fish it was all over – exactly 3 seconds (as recorded by the camera metadata). But that seems to be all it takes by the look on his face in the last frame. There you go…you saw it here first! Read more at New Zealand Geographic Magazine. The next issue #101, carries the article that this shot was for. Consider subscribing to the magazine - it’s a beaut. Thanks to Ranger Abby Meagher at Department of Conservation in Whangarei. Her help in understanding the birds and monitoring their behaviour on this assignment was very important. Brilliant idea! 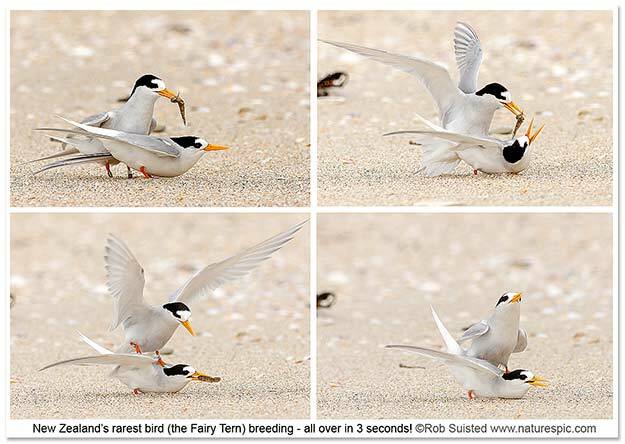 I’m surprised the birds didn’t mind being sneaked up on… and I hope they are successful in having some little Fairy Terns to add to the few that are left. Excellent idea..and the shots are awesome. 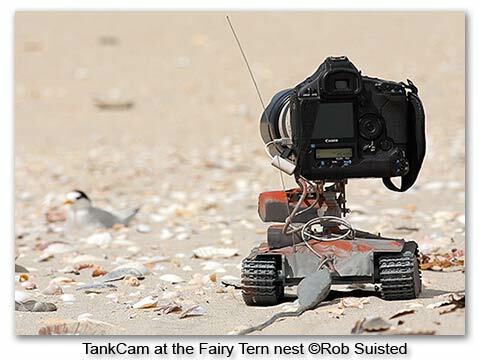 Awesome Rob, fantastic tankcam and photos. Yes, we monitored their reaction closely and slowly inched the tank in closer over about an hour and then left it there. They didn’t seem to be concerned at all. The article is out now in NZ Geo Magazine and looks good. Utterly awesome idea and you got equally awesome shots! I really admire your work in getting these images while considering the impact on the wildlife. If only more wildlife photographers were just as conscientious. Thanks for sharing this behind-the-scenes look at your photo shoot. Hmmm, beautiful beaches, remote controlled toys, portable technology, sneaking up on good looking birds….I want your job!! Nice work Rob and great to see dedicaion and passion in bringing the beauty and delicacy of nature to the world. Thanks Duncan. It was an enjoyable shoot. Hope things are good with you. Was thinking exactly the same, cool site, thanks. You're reading Shooting New Zealand’s RAREST bird with a TANK at Nature’s Pic Images Blog.